Summertime and the living’s easy, and momma’s in the kitchen blending raspberries. All the people in her house will agree that she’s well qualified to represent the HMC*. She, she and Finley preheat the oven, food processing and sifting almond flour. In case you haven’t noticed, I’ve been on sort of a hiatus with blog posts lately, hit by a nasty little case of creative funk. Sometimes you just need to take a break, then when you come back you’re fresh on your game. Am-I-right? 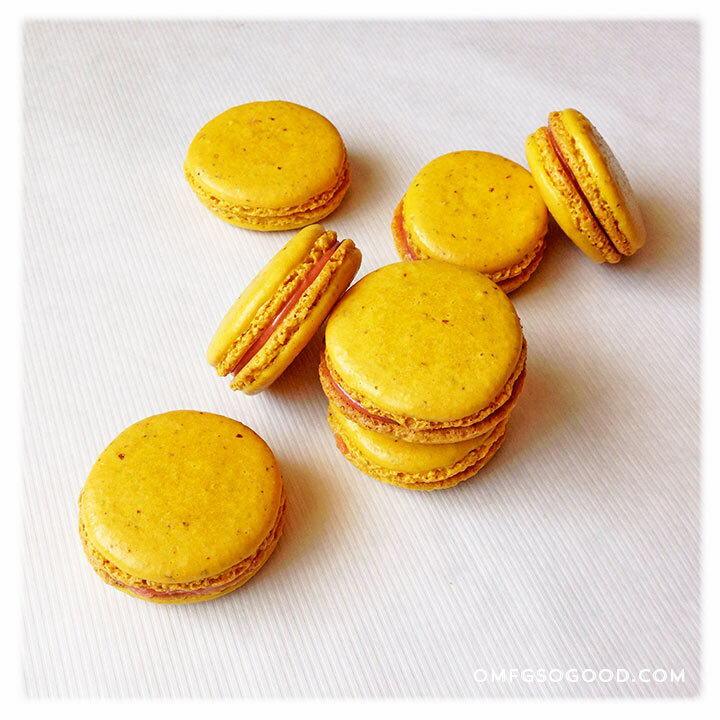 Fresh on the game doesn’t even begin to describe these macarons, chums. But then, I’m a huge fan of anything lemon for summery treats. And, of course, macarons will always be welcome in my mouth. Remove the pan from the heat, whisking continuously. Pour the cooked curd through a fine-mesh sieve into a glass bowl. Cover with plastic wrap, pressing it directly against the surface of the curd. Refrigerate until cool. Puree the raspberries in a blender until smooth. Strain the puree through a fine-mesh sieve into a bowl, discarding the seeds. Once the curd is chilled, fold the raspberry puree into the bowl, cover and return the mixture to the refrigerator. To make the lemon macaron shells, line two rimmed baking sheets with parchment paper, and position this handy-dandy Macaron Piping Template beneath the paper for easy piping of consistently sized & shaped macarons. Combine the almond flour and confectioners sugar in the bowl of a food processor and pulse until finely ground. Sift the mixture into a mixing bowl and set aside. Place the egg whites in a large mixing bowl and beat on medium speed with a hand mixer. When the eggs are frothy, add in the cream of tartar, then gradually add in the granulated sugar one spoonful at a time until fully incorporated. Add in the lemon zest and vanilla and continue to beat until glossy, soft peaks form when you lift the beaters. Do not over beat. Using a rubber spatula, gently fold in half of the almond flour mixture, lifting from the bottom, up around the sides, then toward the middle. Add the second half of the almond mixture and repeat the folding process. This is where the work comes in. Take your rubber spatula and sink it into the center of the batter, then gently scrape the batter up the side of the bowl using the side of the spatula. This is called ‘macaroning’. Do this around 10 times, or until the batter is glossy and has the consistency of molten lava. Pour the batter into a pastry bag. I like to put the empty bag inside of a tall empty glass and fold the top down around the edges. This makes it super easy to fill, and then you can just lift it out, twist it closed and snip the very end off for piping ease. Pipe the batter into the center of the circles using the template under your parchment paper. Don’t over fill them, just pipe a small amount in the center and allow it to fill the circle on it’s own. Holding the baking sheets in both hands, gently drop them flat down onto the counter two or three times each. 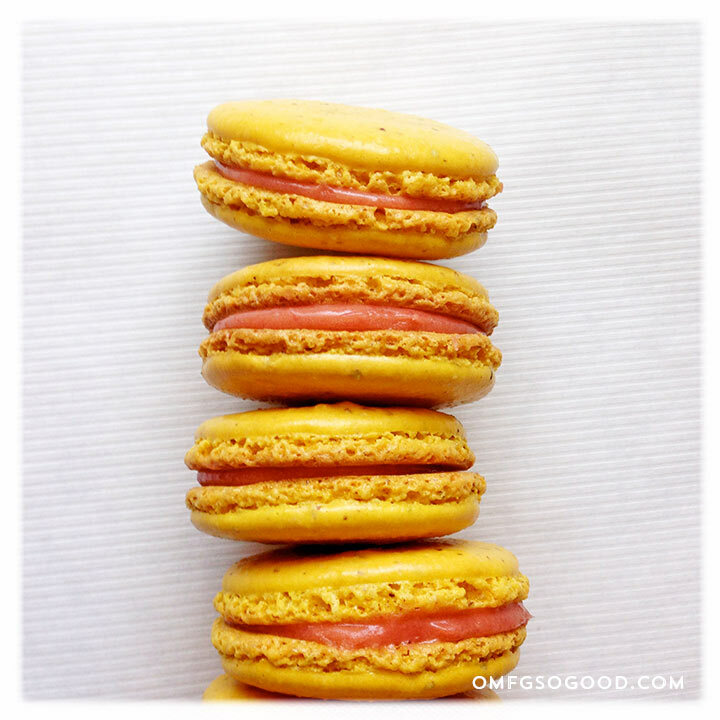 This smooths out the tops and helps form the ‘foot’ on the bottoms of the macarons. Allow the unbaked macarons to rest and dry, uncovered, for 45 minutes – one hour before baking. They should form a very thin, smooth crust so if you tap one lightly with your finger, the batter will not stick. While the shells are drying, preheat your oven to 280ºF and arrange the racks in the lower third of the oven. Place both baking sheets in the oven and bake the shells for 14 – 16 minutes. Halfway through, rotate the sheets for even baking. The shells are done when they are baked all the way through and the shells are just hard. Underbaking will give you mushy centers, overbaking will give you dry, brown macarons. Don’t do either. Remove them from the oven and cool on the baking sheet placed on a wire rack. When they are fully cooled, pipe a small round of the pink lemonade curd in the center of one half of the shells, and gently top with the remaining halves. 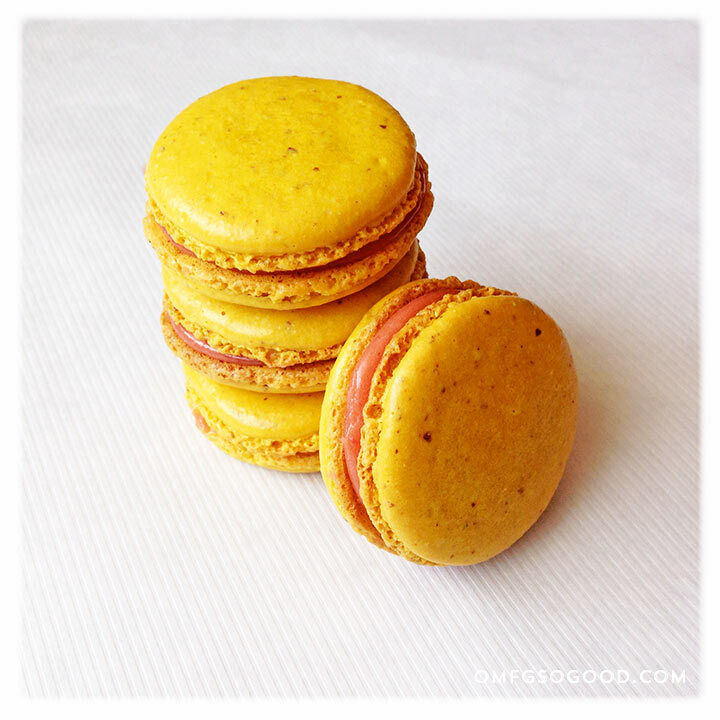 The macarons can be stored in an airtight container in the refrigerator for up to one week. Any leftover pink lemonade curd can be stored in an airtight container in the refrigerator for up to two weeks for use on ice cream or with toast… or just spoon that sh¡t right into your mouth. Don’t be shy, folks.